According to the Centers for Disease Control and Prevention, roughly one in three U.S. traffic fatalities involve a drunk driver. While drunk driving is a serious problem nationwide, an Arlington Heights auto accident attorney knows that statistics specific to Illinois indicate that the problem is especially severe on state soil. Data from the National Highway Traffic Safety Administration shows that Illinois ranked eighth in the nation for drunk driving-related automotive fatalities in 2013, with 991 related deaths occurring on state roadways that year. With the CDC reporting 3,866 total drunk driving deaths in Illinois between 2003 and 2012, residents and lawmakers are seeking additional methods of helping residents stay safe on Illinois roads. While residents can do their part to enhance roadway safety by refraining from driving after drinking, staying safe also involves remaining vigilant of how to spot others engaging in dangerous driving behaviors. Here is a look at five key signs that may indicate an impaired driver on an Illinois roadway. According to NHTSA, many impaired or intoxicated drivers struggle to maintain proper lane position while operating a vehicle. This may involve a vehicle weaving across lanes, moving from side to side within the same lane or straddling a center lane or lane line. Another common lane-position issue is a process called drifting, which involves a vehicle moving in what is close to a straight line, but with a slight pull to one side or another. Sometimes, a driver engaging in drifting behavior notices his or her mistake and attempts to correct it by jerking the wheel, but this is not always done in enough time to prevent an accident. Turning with an especially wide radius is another common lane-position clue that a motorist may be under the influence of alcohol. NHTSA states that many impaired motorists struggle to brake properly and effectively. An Arlington Heights auto accident attorney knows Illinois law enforcement officials are trained to spot this type of behavior. Common stopping issues experienced by drunk drivers include stopping far away from a curb or at a particularly awkward angle, or stopping too short or too far past a roadway limit line. Sometimes, a drunk driver can be detected if he or she engages in jerky or especially abrupt stops, so motorists should be on the lookout for these types of stopping issues to enhance their chances of avoiding a collision. Illinois law enforcement officials also know to watch for issues with speed when on the lookout for impaired drivers. One sign that indicates a motorist may be intoxicated is if he or she is rapidly accelerating or decelerating a vehicle without any apparent reason, or if he or she reverts from speeding up to slowing down in an area where the speed limit remains consistent. While traveling too quickly for the posted speed limit is often a sign of impaired driving, traveling too slowly for posted speed limits is as well. The NHTSA states that traveling 10 miles per hour or more under the posted speed limit may indicate driver intoxication. NHTSA reports that issues with vigilance, or those involving a driver’s ability to pay attention or observe changes in his or her surroundings, may indicate an under-the-influence driver. Examples of this type of behavior may include forgetting to turn one’s headlights on when traveling at night or failing to use turn signals properly. Using turn signals inappropriately, like using the left blinker when turning right, is another potential sign of an impaired motorist. Driving into opposing or crossing traffic, like heading in the wrong direction on a one-way street or failing to yield appropriately, are additional examples of this type of driving behavior. Alcohol affects judgment both behind the wheel and otherwise. 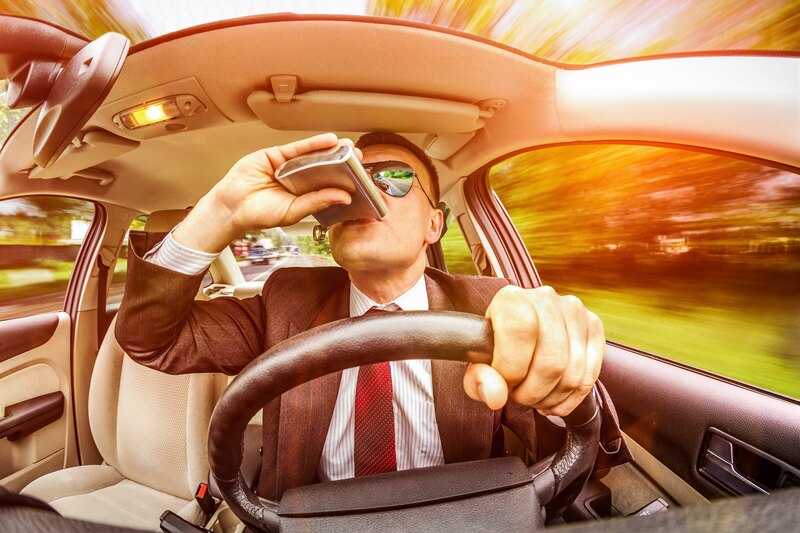 According to NHTSA, even small amounts of alcohol have the ability to impair one’s judgment and can lead a driver to engage in a number of risky driving behaviors. These types of dangerous behaviors may include following behind other motorists too closely or failing to leave adequate stopping room between vehicles. Unsafe lane changes are another possible indication of driver impairment, as is taking a turn too fast or overcorrecting these types of mistakes with jerky or sharp maneuvers. Impaired drivers are also more apt to make illegal turns or drive in areas other than the designated roadway, such as on curbs. While Illinois’ drunk driving statistics are sobering, an Arlington Heights auto accident attorney knows that strides have been taken to help minimize alcohol-related automotive accidents and related injuries and fatalities. Mothers Against Drunk Driving reports that the state was among the first in the nation to enact an all-offender ignition interlock law. Some believe this action was partly responsible for the reduction of drunk driving fatalities in Illinois since the law was first enacted in 2009. However, because Illinois DUI offenders have a choice as to whether to use the ignition interlock device or undergo license suspension, close to 80 percent of offenders opt for the latter. MADD believes that enhancements to Illinois’ ignition interlock law would enhance safety for all motorists on state roadways. Illinois drivers who spot any of the aforementioned signs or any dangerous driving behaviors that may indicate an impaired driver are encouraged to report the driver in question to the closest State Police Headquarters. Those who suffered injuries or whose family members were killed at the hands of a drunk driver should contact an attorney.